.:. Hiking in Big Sur - Limekiln Trails .:. 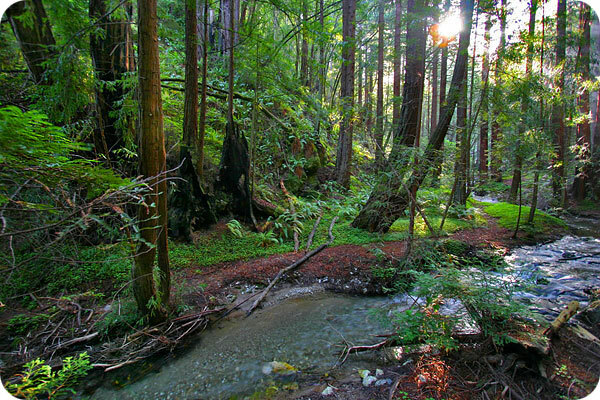 Once you've parked, head east away from the ocean along the paved road through the campsites under the tall redwoods. Up ahead you'll see a bridge and the kiosk marking the start of the trail. The Limekiln trail has three branches each a half mile or less long and all worth exploring. I recommend taking the Hare Creek branch first, followed by the Falls branch and finally the Limekilns branch. All of the these trails are kid-friendly, but of the three, the branch to the waterfalls is the most challenging and can involve scrambling across running creeks. Expect some wet shoes. A short distance after crossing the first bridge is the first fork in the trail with the path to the limekilns and waterfall to the left and Hare Creek to the right. The .3 mile trail through Hare Canyon is well-groomed and easy, sporting some of the oldest and largest redwood trees in Big Sur. The trail follows along the creek in a magnificent and photogenic setting until you reach an "End of Trail" sign near a mini waterfall at the base of a huge rock wall. Turn around here and head back to the fork. At the fork, take a right towards the limekilns and waterfall. The path meanders under the redwoods above Limekiln Creek, which you cross on a large wooden bridge and eventually reach the next fork with branches heading either to the limekilns or waterfall. 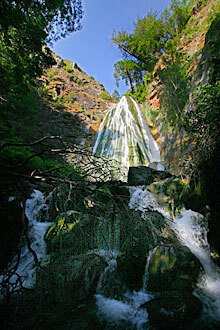 Take a right for the falls, and be prepared to traverse the first of 5 tricky stream crossings. The trail deadends with a stunning view of the 100 foot waterfall cascading down a huge limestone face. Turn around and head back to the fork, this time taking a right for the trail out to the limekilns. The four enormous kilns were built near the turn of the century and are largely intact. The Rockland Lime and Lumber Company would load the towers of the kilns with limestone and use redwood lumber to stoke fires at their bases to purify the rock before it was hauled out of the canyon and down to the coast where ships were waiting. The lime was eventually used in cement and other products. The trail ends at the kilns, where you can turn around and head back to the parking lot. After finishing the trails on the inland side of the park, head west across the parking lot to a road that goes under HIghway 1 and out to the beach. We've seen dolphins frolicking in the waves 100 yards offshore here in January. 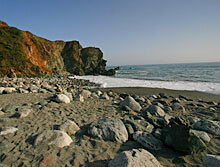 Limekiln State Park is centrally located in Big Sur, 2 miles south of the small community of Lucia. The park entrance drops off the inland side of Highway 1 and is 26 miles south of the Pfeiffer Big Sur State Park entrance. From the south, the park entrance is on the right, 37.5 miles north of the Hearst Castle turnoff, or 2 miles north of the Nacimiento-Fergusson Road turnoff.